I was shopping at Kroger a while back. Just a normal, regular ol’ shopping trip. While looking for the spicy mustard, I came across what could have been a gift from The Lord above. If a better idea has ever been thought, I am not aware of it. The line on the bottle states that everything should taste like bacon. Isn’t it the truth? Isn’t bacon the most perfect food in the world? I mean, it’s got flavor, chewiness, crispness, and saltiness. It’s got all the best -ness words! I had to have it. I bought one for me and a few as gifts. Seriously. I gave one to a student of mine as a token of my appreciation for all she does for me. She was excited and rightfully so. 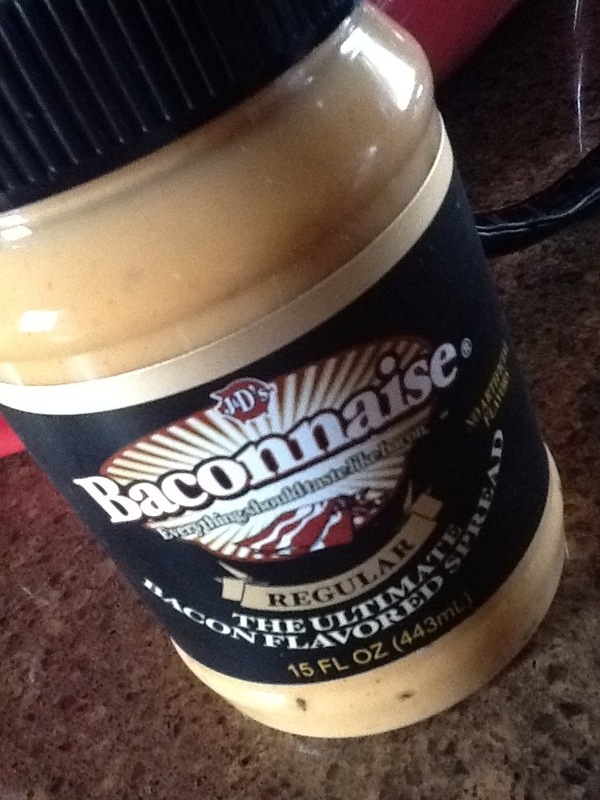 Baconnaise is bacon in a spreadable fashion. Genius, I say, and she agreed. She later told me that it was great on crackers, and she was planning on broadening her Baconnaise repertoire. I couldn’t wait to start mine. So, one day I did. At lunch, we were having sandwiches with chips and dip. The Baconnaise was brought to the table. I had to experience this gift from above for myself. The result? Blech. I think my student told me about the crackers just to be nice. 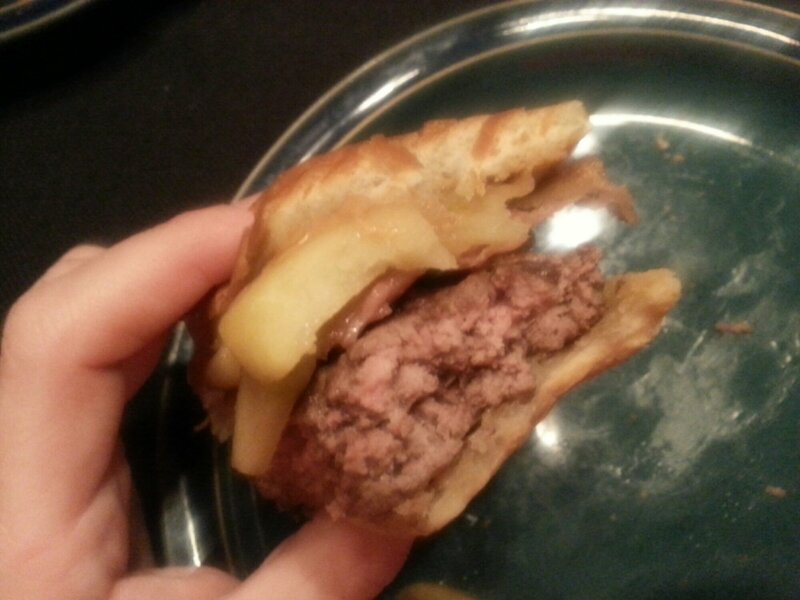 I was pretty sure one bite was enough, and the flavor was one that I figured I would be retasting all day. Oh, well. If there is anyone who can improve on this idea, do. I think humanity needs this. Delicious pork in a spreadable form so we can make everything taste like bacon. This recipe is a good one-even if I did it in a unique way. I found this recipe in Rachael Ray’s magazine. Usually when Rachael’s magazine shows up, I thumb through it, and I throw it in the recycle bin. A few recipes in her December issue, however, were interesting. 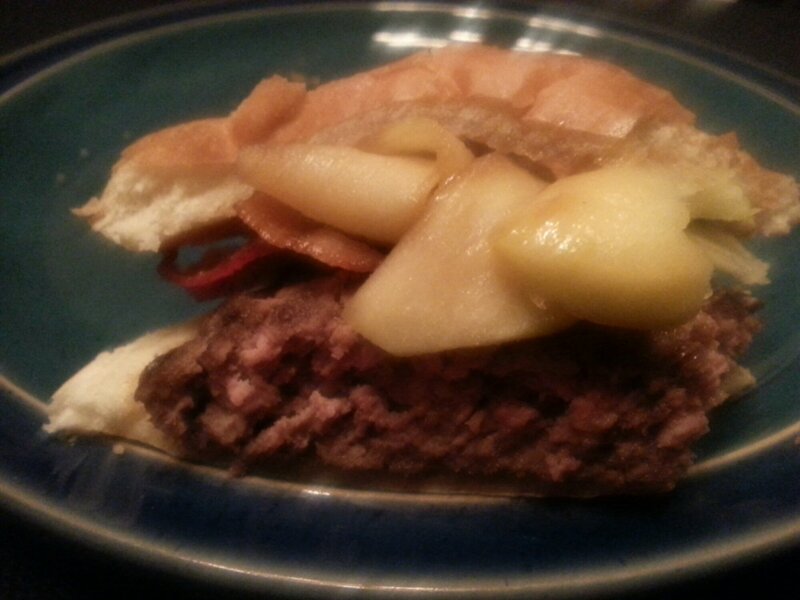 Of course, I didn’t have all the fancy ingredients that the recipe called for, and so I made do. I also started it one morning for supper the next day. Sometimes I like to drag stuff out. Combine the garlic and red pepper flakes and sprinkle over the pork. Gently sprinkle the salt and pepper over the pork too-you don’t need a lot of salt here. 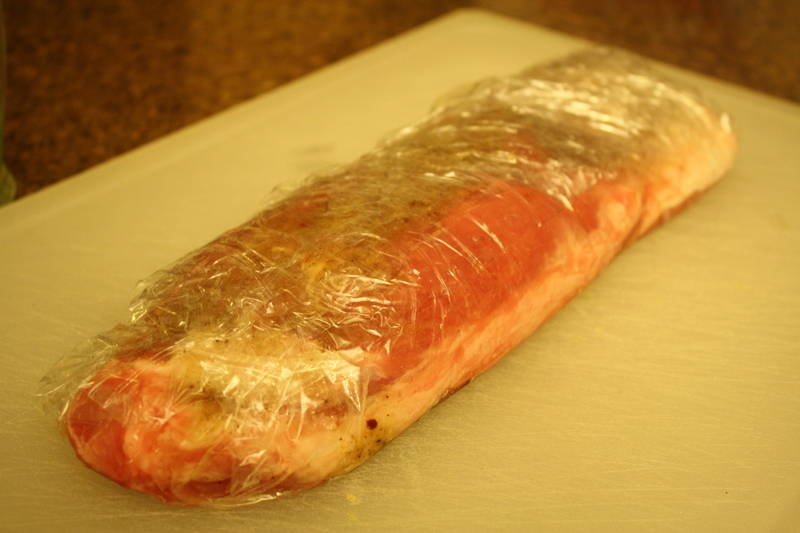 Wrap the seasoned tenderloin in plastic wrap and place it in a container in the refrigerator all day. Go do random things like shop, eat Chinese, and watch mind-numbing TV. Later that night, about two hours before bedtime, decide it is time to cook the pork. Remove the plastic wrap. Cut several strips of bacon in half. 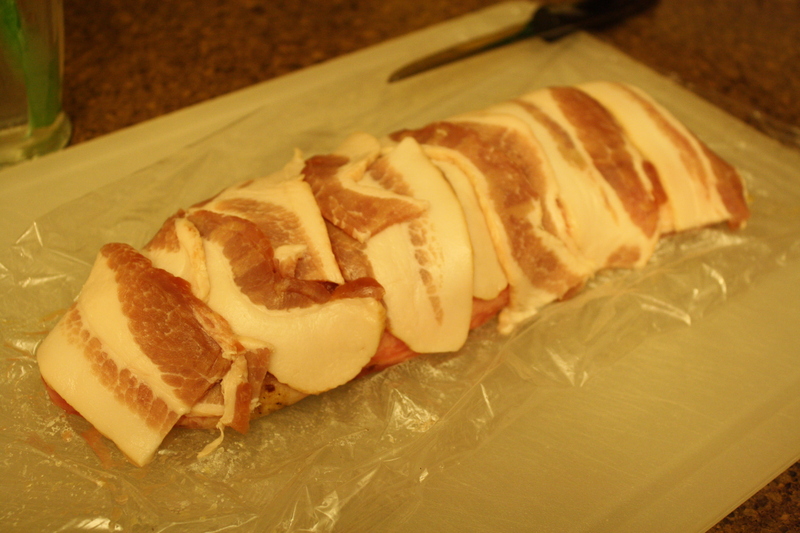 Cover the pork loin with the halved bacon so that the pork is completely covered. Then, transfer the pork to a roasting pan and roast at 350 for 1 1/2 hours. After the pork has roasted and your kitchen smells divine, sleepily remove the pork from the oven, allow to cool, place it in a container, and return it to the refrigerator for tomorrow. Go to bed and dream of that smell. 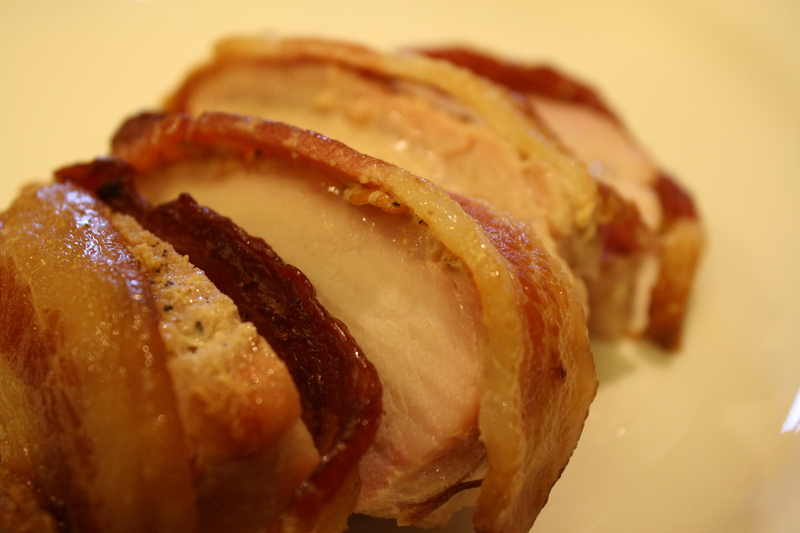 Around supper time the next day, wrap the pork loin in aluminum foil and warm in a 300 degree oven for about fifteen minutes. This pork is unbelievably juicy and the bacon is delicious. 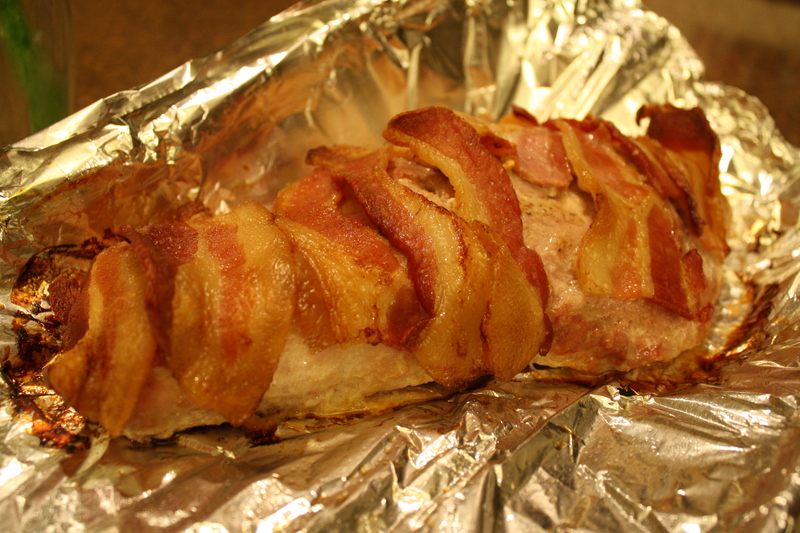 Of course, you can wrap anything in bacon and it will be delicious. Saturday mornings were made for breakfast makin’. The usual fare at our house is pancakes, plain for me followed by chocolate chip for everyone else. A meal of pancakes starts the weekend off right. This week at work, things were a little quiet as my kids were taking tests, and so I had a little free time to explore my cookbooks. One on the pile to search for new things in was the Pioneer Woman. I love her recipes, hate her show. Regardless, I chose several new recipes to try-a cake, a meatball thingy for bookclub, a chicken wing dish, and a new breakfast dish to try. This morning, the breakfast muffins made their debut. I decided to scale PW’s original recipe back a little. Even if they were delicious, we didn’t need twelve breakfast muffins for four people. I also could not sacrifice a dozen eggs and a pack of bacon for one dish. I used about three fourths of what she called for for each ingredient and broiled the muffins accordingly. When I opened the oven, the smell was intriguing. The muffins with all their breakfasty goodness, including an almost uncomfortable amount of eggs and bacon, looked very yummy. Their tops had browned and the edges of the English muffins were perfectly toasted. I was impressed. We sat down with our muffins and the usual pancakes. The muffins? Worst recipe ever. I mean, they were totally gross. The intriguing smell was the smell of too much worchestire sauce before noon and too much mayonnaise for anytime of the day. I tried one before anyone else, and my bites were like eating a hot, manly deviled egg. Bleh. This recipe was not a keeper. Instead, my experience may cause me to tear the recipe out of the cookbook. I’ve got no love for these love muffins. The Pioneer Woman is a lovely lady. I like her cookbooks. Her food is good. She has nice cars and a nice lodge. Ok, truth be told. I do question her authenticity at times. Case in point-her smashed potato recipe. I tried to make it once. I followed her almost exactly until I got to the point in which I was to take a small boiled potato and smash it in one direction with a potato masher and then turn the masher slightly to mash the potato again all the while creating a lovely pattern in the potato. It was not a success in my kitchen. Do you know how long smashing all those little potatoes takes? Good Lawd almighty. I thought I was going to croak right there mashing all these danged tiny potatoes in a little pattern. The potatoes were hot as fire, and they kept sticking to the masher. I had to scrape them off and then mash them again. Pfft, I say. Now, tell me how a woman who blogs uncontrollably, has four children, takes so many pictures, makes TV appearances, writes cookbooks, and does all the other PW stuff she does has time for patterns in potatoes? Fancy mashed are to the right and the rear. Normal people mashed are to the left and front. There will be no more fancy, schmancy potato patterns in my kitchen, friends. Round here, we smash our taters like real people-with the back of a knife, or with a scraper, or with a spatula, or even with our fists if we are feeling sassy. So, how do we prepare real people mashed potatoes? Let me tell you. First, find some small whole potatoes. I’ve used both red and gold, and both types worked fine. Rinse them well, and boil them in plenty of salted water for around twenty minutes. They are ready when you can easily stick a knife through them. While they are boiling, fry some bacon and save some of the drippings. Drain the potatoes when they are ready and let them cool a minute. When they are cool enough to handle, place them one at a time of a flat surface like a cutting board. Then, pound, baby, pound. I mash them until they are around a quarter-inch thin, if not thinner than that. I especially like to use my metal scraper for pounding since it is wide and flat. I smash those potatoes like nobody’s business and then scrape them up with my scraper, but a solid spatula would work lovely too. 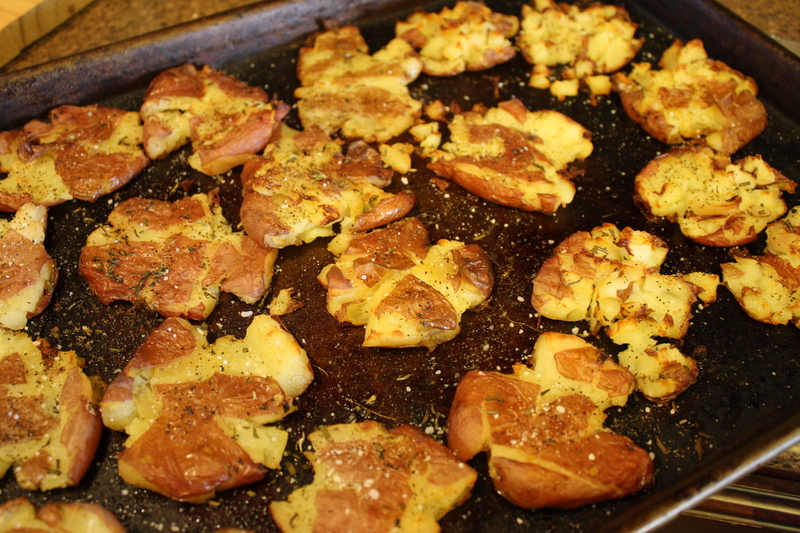 Line the smashed potatoes up on a baking sheet. Into a bowl, crumble your bacon along with a lot of good shredded cheese-I like sharp Cheddar-some softened butter, a dollop of sour cream, and whatever else suits your fancy. Scallion tops would be good here. Maybe some ranch dressing too. And definitely salt. You get the drift. Mix all that good stuff in the bowl and top your potatoes. 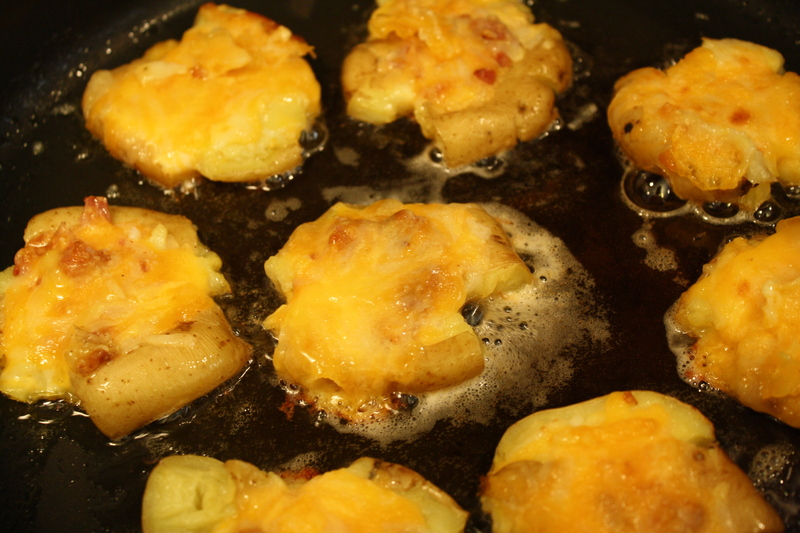 Pour a little of the bacon grease around the topped potatoes and bake the whole shebang at 350 for 20 minutes. The bacon grease will help give the skins a nice crunch and add so, so much flavor. 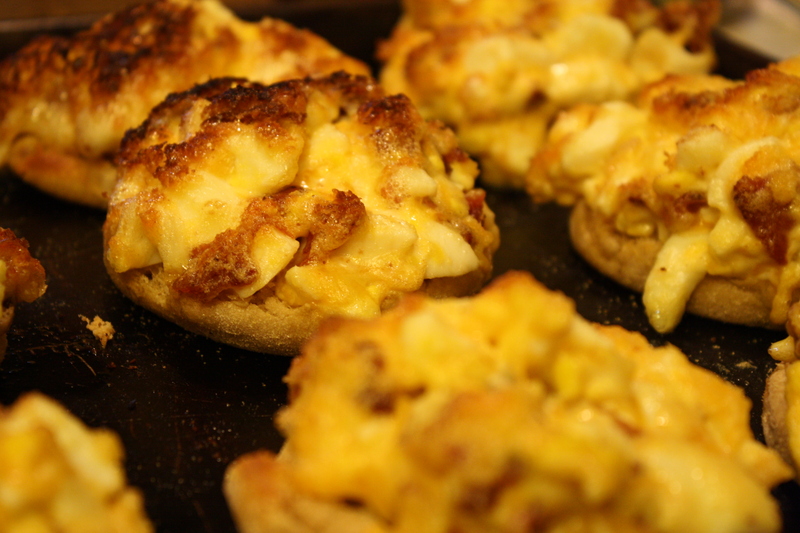 Once, we had some vegetarian-esque friends over, and I made these. Our guests ate the dish fervently, even though the taters obviously had bacon on them. 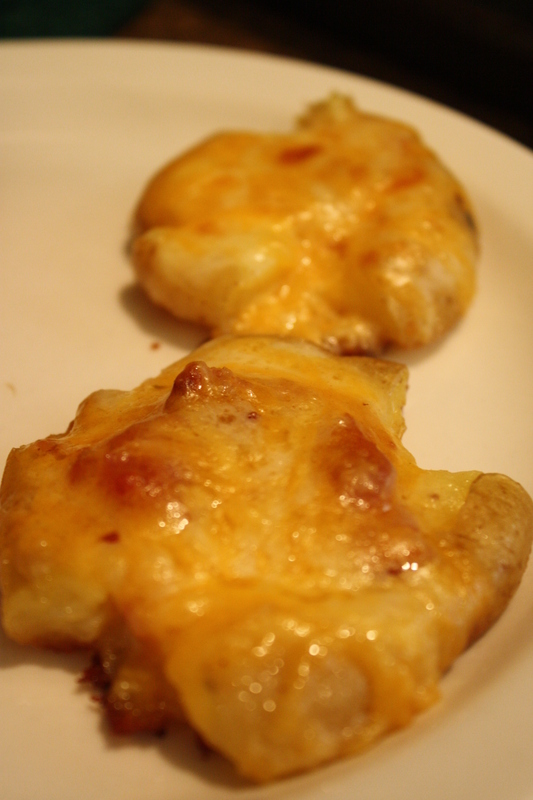 They raved over how good these potatoes were and asked for the secret of the recipe. It was a pleasure to tell them the secret ingredient was bacon grease. I wanted to sneer at them, “See what you’ve been missing all this time, you yuppie!” I didn’t though. I think they learned their lesson. 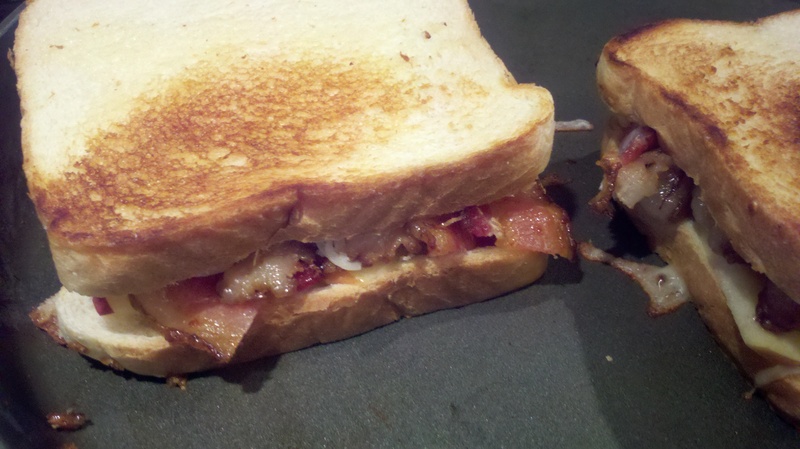 You are not living unless you eat something with bacon in it, I tell ya. Leftovers are delish too. I reheat mine in a skillet with a little butter and, you guessed it, bacon grease. Drain them well, and they are even better than the day before. These little babies are love on a plate. They are cheesy good and crunchy to boot. They make husbands happy and make semi-vegetarians question their life choices. Not only all of that, you can take out your frustrations and make dinner at the same time. Now, that is something even a blogging momma of four can actually do. We all have many kinds of Facebook friends. I know I do. For example, the first kind of FB friend is the friend who is really, really a friend. My momma is my example of this. And, I have the friends who were once friends but now not so much. Several of my friends from high school fit into this category. I have the type of friend who is not really a friend but you have to have them as FB friends anyway because you have no choice. My creepy cousins and a few people I work with, for example. I also have the friends who were never really friends on the first place, but I want to see what they are doing because I am nosey. Several of my sorority sisters who may or may not have been mean to me fit into that category. Then, you have the friend you know but don’t really know until you reconnect on FB. A friend you had all but forgotten about until one fateful friend request. That’s my friend Trish. This gal’s got it all-deep Southern roots, a story telling ability partnered with the keen sense of how things work on the page, a sense of humor I love, a handsome and smart family, a Doctorate. And? This girl can Cook with a capital c.
One day this summer, amid the dull daily updates-“I’m having cereal for breakfast!”and the blurbs from random cousins who use way, too, many, commas, I found a picture of a sandwich. This sandwich was way prettier than my sorority sister’s scary pageant kid. It had bacon. Cream cheese. Peaches. Wow. My FB friend Trish was the maker of this wonder, and I immediately messaged her as only FB friends can do to ask her permission to share this magical sandwich with you. And she, being a good-hearted Southern woman, said yes. 2 T Basil-I used dried. Trish used fresh. You do what you gotta to do. Cook your bacon but not until crispy. You want the bacon just up to crispy but not there yet. Mine was overdone. Drain on a paper towel. 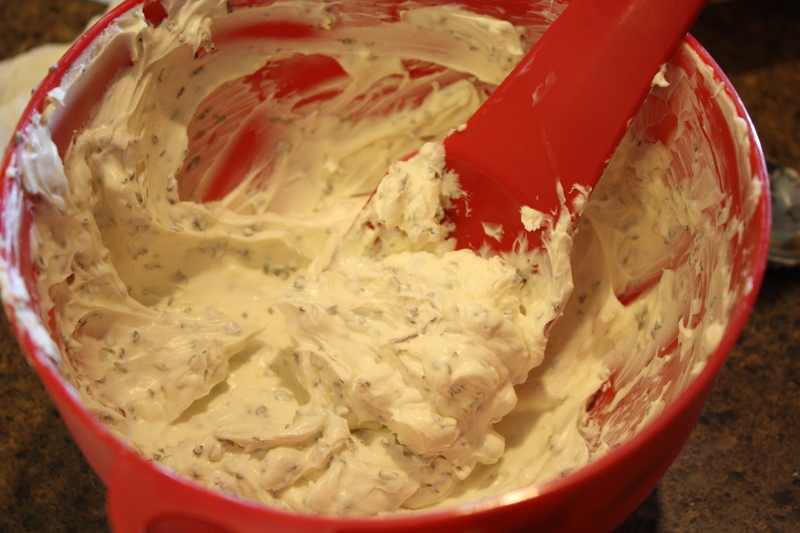 In a small bowl, mix your cream cheese and the basil. This is gonna be sooo pretty! Peel and slice the peaches. Slice them pretty thick. 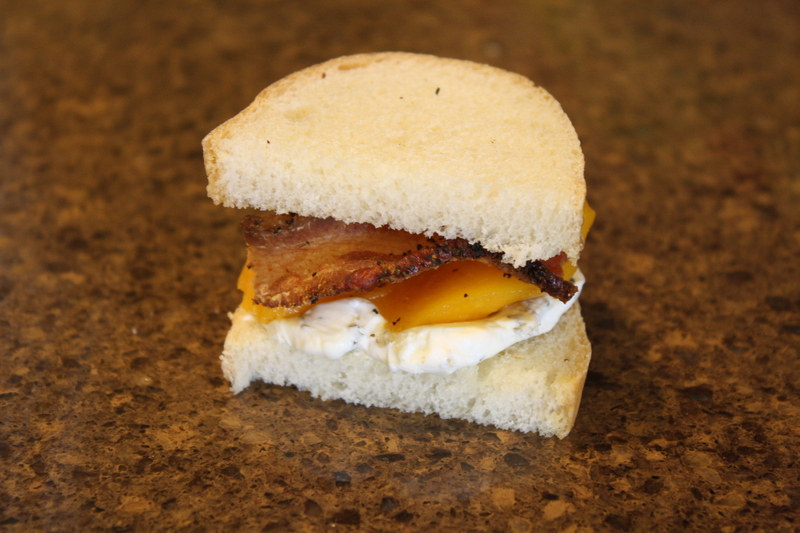 Assemble-bread, basil cream cheese, peaches, bacon, bread. Yum. Our book club is a friendly place where we eat delicious food. However, I always like to have the best dish. Even though no one else knows we are competing, I mentally keep score. Let me tell you, it is hard to win. My momma is in our book club. So are many of my teacher friends who can bake anyone under the table. One girl is the sandwich queen; her chicken salad is to die for. Then there is my friend who is also our vet. That girl can flat out put anything on a cracker, and it will be delish. The competition is imaginary yet fierce. My response? I humbly (or not) said, “My friend Trish. She is a professor in South Carolina. I’ve known her for years! She let me borrow the recipe.” I sounded sooo cool saying that! I do believe I won that month at book club. 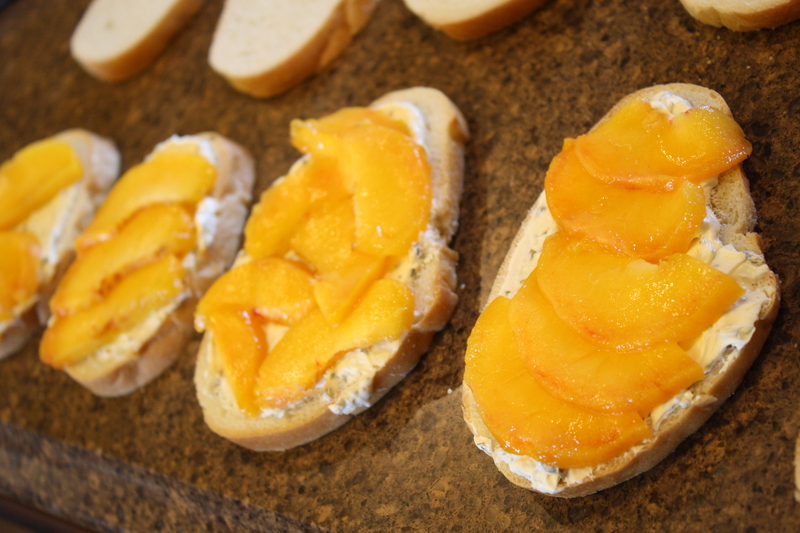 All thanks to these bacon and peach sandwiches and my friend Trish.